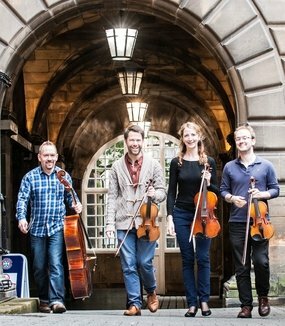 Founded in 1960 The Edinburgh Quartet celebrates an extensive and exciting history as one of the UK’s leading chamber ensembles, having performed frequently at major venues across Britain and toured extensively across Europe, the Far and Middle East, and North and South America. In addition to an eventful concert schedule the Edinburgh Quartet can be heard regularly on BBC radio amongst other stations. The Quartet supports new music and living contemporary composers, such as James MacMillan, Michael Tippett and Howard Blake, however in this concert, ‘Postcard from Paris’, we see they are equally talented in bringing traditional classics to life. Harking back to their origin, they demonstrate what a vast range they can create. The opening concert of their Queen’s Hall season is entitled ‘Postcard from Paris’, as the schedule is loosely inspired by the growth in Paris’ musical connections. A trio of Violinists Tristan Gurney, Gordon Bragg and Jessica Beeston and solo Cello player Mark Bailey open with Franz Joseph Haydn’s String Quartet in C. Consisting of four movements, the first is light, jovial and playful, the second turns somber, slow but dramatic and the third is a Menuetto. The musicians performed this piece outstandingly. I lost myself in the music, however Haydn maintains to challenge the conventional and throws in the odd unpredicted surprise to keep us on our toes. After a brief interlude where Violinist, Tristan Gurney explained the Parisian connections behind the performance, he introduced Claude Debussy’s String Quartet in G minor. Debussy lived in Paris and I truly felt I was immersed in the throngs of Parisian life. High in energy, the piece flows from slow meandering emotion to high-tension drama. Then spirals down to a still hum, a highly emotive journey. The quartet delicately pluck the strings creating a jumpy experimental dramatic energy in the second movement. The theatrical dynamic builds with elements of cine magic. This powerful charismatic piece flows, spins, glides and tingles until finally building into a frenzy of spectacular energy. The daring contrasting movements throughout the composition produces a rich story. Debussy’s revolutionary String Quartet is considered by many to be one of the finest quartets ever written and it was undeniably my favourite of the evening. Following the interval the Quartet were joined by a solo Pianist Simon Callaghan, to perform Cesar Franck’s Quintet for piano and strings in F minor. Franck was a Belgian composer who lived and worked in Paris. The Piano Quintet is one of Franck’s most comprehensive instrumental compositions. The pianist opens the piece with dramatic vigour. The Quartet follow producing a powerful and wonderfully executed piece with tantalising pauses. The pianists hands effortlessly dance across the ivory keys. The emotionally charged piano Quintet evokes great sadness, elegant peacefulness then rises to a theatrical finale. The varied textures and skill of this composition generates remarkable stimulation.